Interface are generally too mono sensory and the dominant sense is often the visual one. 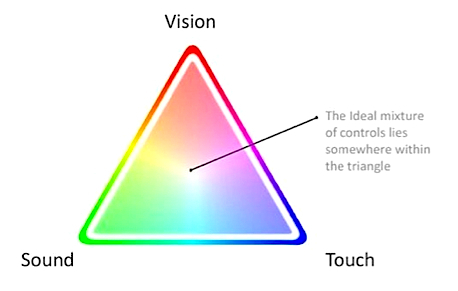 Our mission is to develop multi-modal interfaces which correspond to our human interactive and interpretative capacity using 5 senses rather depending on the one visual one. Developing sophisticated multi-modal solutions for High Stress Environments like the Automotive or Medical one is a key aspect of our research and development. From 2005 to 2010 we undertook a series of HMI research and user testing project with Toyota Europe. The findings were presented to TMC in Nagoya. This work was based upon several projects ranging from user testing in 6 countries to scientific analysis of the touch screen interaction and icon localization. In the 4D model the screen represents a window on to a virtual border-less virtual space. The screen is a “cut out” which pans across this space, rather like the ”View-Finder” of a camera. The Camera (mind) sees a landscape (information representational model) which it recognizes and understands. The purpose of this project was to test the theory in relation to cognitive methods of interacting with information. In the context of car information systems the current approach, based solely on the written word and icons, has reached its interactive limit.